Bit of an old one this week, but still rather lovely. 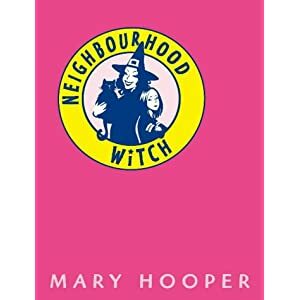 Neighbourhood Witch was published in 2004 by Walker Books (ISBN: 0744583608) and is a slim, fun little read of 89 pages. To give you a comparison, it’s probably best to describe it as ‘world book day size’ as it’s very similar to the special books published for World Book Day. Ever heard of the WI? Ever heard of Neighbourhood Watch? Usually these refer to the Women’s Institute and a spirit of neighbourhood awareness signified by stickers on windows and signposts. But if you looked more carefully at these stickers, you’d see that every now and then one of them didn’t say Neighbourhood Watch – they say Neighbourhood Witch and that the WI doesn’t stand for Women’s Institute, it stands for Witches Institute. Amber’s mum is one of them – and so is Amber. Well, not right now, but she’s going to inherit the power. But all Amber wants to be is normal and very much so right now because she’s starting a new school and that’s the last time you want to stand out. Amber ends up making friends with a girl called Georgie and it’s when Georgie gets herself caught up in a sticky situation, Amber decides to help out – and so does her mother. Mary Hooper is one of those authors who writes girls and their relationships really well. If you’ve not read her Megan books you’ve missed out. Neighbourhood Witch is definitely for the younger market (8+) and it’s a fun, quick read that’s nicely handled. It would be great for somebody as a lead up to discovering something like the Worst Witch books. I have a great yen now to go for a walk around my neighbourhood and see whether we have any neighbourhood witches!